A medium coarse oven roasted mushroom pâté topped with red wine and shallot chutney. 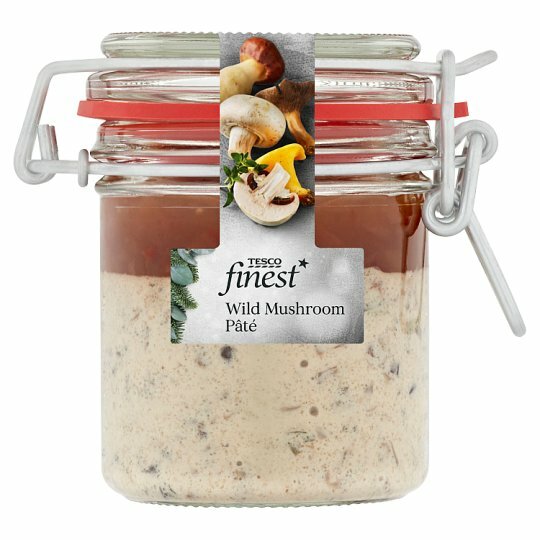 Tesco finest * Wild Mushroom Pâté Tesco finest * Wild Mushroom Pâté with Red Wine & Shallot Chutney Using a mix of wild and roasted mushrooms expertly blended with crème fraiche, porcini mushroom stock, rosemary and thyme. Finished with lemon juice and tarragon for a coarse and full flavoured pâté. Topped with a caramelised shallot and red wine chutney. INGREDIENTS: Caramelised Shallot and Red Wine Chutney (20%)[Water, Brown Sugar, Roasted Shallot (11%)[Shallots, Sunflower Oil], Red Onion, Red Wine (3.5%), Red Wine Vinegar, Gelling Agents (Agar, Carob Gum, Pectin), Cornflour, Dried Red Pepper, Salt, Black Pepper], Roasted Mushroom (13%), Full Fat Soft Cheese (Milk), Crème Fraîche (Milk), Single Cream (Milk), Water, Wild Mushroom Mix (6%)[Fairy Ring Mushroom, Chanterelle Mushroom, Black Mushroom, White Mushroom], Rapeseed Oil, Onion, Tapioca Starch, Lemon Juice, Porcini Mushroom Bouillon[Mushroom Concentrate, Yeast Extract, Salt, Rehydrated Potato, Porcini Mushroom, Sugar, Lemon Juice Powder], Pasteurised Egg, Garlic Purée, Salt, Sugar, Cider Vinegar, Cornflour, Spirit Vinegar, Tarragon, Thyme, Rosemary, Black Pepper, Nutmeg.